Learning adventures help you do it yourself. Whether you want to maintain your own site, market yourself through social media, or boost your search engine rankings, I offer classes covering a wide range of topics. The web gives all of us the ability to bring our unique talents to the world. My goal is to share the specific methods for doing that in a way that's engaging and effective. Learn whenever you like, make progress on a schedule that works for you. These classes give you the comprehensive view you need to make the most of your online promotions. Build your online presence month by month. Through these project-based kits you'll create a complete online marketing plan, optimize your social media profiles, tune-up your website, create a small business video and make many other valuable assets specially designed to drive new clients to your business. These kits are great for small business owners, entrepreneurs, nonprofit professionals and people looking to boost their employability with web-related job skills. Periodically I offer live onsite sessions too, which are a great way to get the support of like-minded colleagues. It's like a group fitness class for your marketing! ​See the projects list. 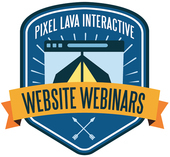 Website Webinars are designed to provide a fun, low-cost, engaging way to learn about a range of website topics from search engine optimization to social media marketing. Each lesson includes an online video presentation and valuable handouts which you can access anytime. These sessions are designed to help you understand larger topics so you can do-it-yourself, effectively delegate or make smart purchase decisions when working with online marketers and search engine specialists. Occasionally I offer live online sessions which include an interactive Q&A period. Either way you'll leave each class with a resource-rich handout and actionable steps you can put to use immediately. See descriptions. My 1-to-1 Trainings are designed to get you up to speed quickly with what you need to know. They are customized to fit your learning level and the specific tasks you need help with - whether that is using social media, managing your site, or just having a clear understanding of a topic in order to make smart management decisions. See details.